Nothing says love like a big red heart and some flowers, which are combined in an unusual way with this cool new Love in Bloom Vase designed by Marcantonio Raimondi Malerba for Seletti. Yes, your heart will bloom with joy or perhaps skip a beat upon seeing this porcelain vase shaped like an anatomically-correct heart, complete with open veins and arteries for holding the stems of your favorite blooms. 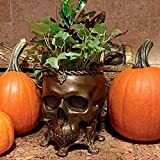 Perfect for adding a striking sculptural accent to any room, especially a doctor's office, and either makes a romantic gift for Valentine's Day or just fill it with dead roses and make it a centerpiece for Halloween. Size: 9.8" x 6.2" x 3.5"